On December 15, Beijing’s illegal apprehension of an American underwater drone in the South China Sea sent Washington a clear message: China was in control of the Western Pacific. Back in 2011, Barack Obama announced America’s pivot to the Asia-Pacific, a foreign policy shift that he expected to allow the peaceful containment of Chinese influence in the region. Several years later, however, as the President’s second term came to an end, it becomes increasingly apparent that his tougher stance towards China did not produce the expected results. In a speech voiced in Tokyo on November 14, 2009, President Barack Obama declared that the U.S. had been, for generations, a nation of the Pacific, and therefore should be involved in discussions shaping the future of the region, as well as become a member of the relevant organizations. Yet, it would be on November 17, 2011, during the President’s Asia Pacific Trip, that the former American leader would explain more concretely his country’s interest in establishing a closer link to the countries in the region. Accordingly, in the Australian Parliament, Obama expressed his belief in the importance of the Asia-Pacific to the realization of his highest priority, that is, creating opportunities and employment for all citizens. The President also claimed that, in matters of national defense, the Asia-Pacific would be America’s top priority. As Hillary Clinton explained, the pivot would take place along six main lines of action: bolstering security alliances, developing relationships with emergent players, engaging with regional multilateral organizations, increasing investment and trade, creating a wide-ranging military presence, and advancing democracy and human rights. The main idea behind the pivot was that the United States were too invested in the Middle East and in Europe, two areas argued to be of dwindling importance to America’s national interests. Contrarily, the Asia-Pacific was believed to be the future, since it held most of the world’s nuclear powers, half of the world’s population, and experienced the fastest economic growth on the planet. However, Obama’s plan was disrupted by a series of global events, particularly: the annexation of Crimea by Russia, the Syrian and Yemeni civil wars, the Iranian nuclear crisis, and the emergence of ISIS. Consequently, the Asia-Pacific shift received considerably less attention. One of the foundations of the pivot was the Trans-Pacific Partnership (TPP), a trade agreement celebrated between twelve Pacific Rim countries, notably excluding China, designed to bring those nations into closer alignment with the U.S.. However, following Trump’s electoral victory, Congress decided not to bring it up for ratification until the next Presidential inauguration. In the meantime, China is pushing its challenging free trade treaty (the Regional Comprehensive Economic Partnership, or RCEP), which excludes the U.S., and is pulling several East Asian and Pacific countries away from the latter, including several of its allies, like Australia, South Korea, or Japan. Another prominent example are the Philippines, a key player in the region, and a valuable U.S. ally since the early years of the Cold War, with which they signed an enhanced defense cooperation agreement back in 2014. However, following the election of Rodrigo Duterte as President of the Philippines, his country has gravitated towards Beijing’s orbit, and announced its ‘separation’ from the U.S.. On late October, the country brought home a series of funding and investment pledges from China, worth approximately $24 billion, and vowed to continue bilateral negotiations with the country over territorial disagreements in the South China Sea. Accordingly, in the last few years, China has created artificial islands on the disputed Spratly archipelago, which are being enhanced with military surveillance, as well as logistics and communications infrastructure, boosting the country’s long-term presence in the region significantly. Amidst accusations from Washington over the increasing militarization of the region, Beijing turned the blame back on the U.S., whose air and navy patrols were condemned for escalating tensions in the South China Sea. In the end, Obama could not allow the U.S. to pivot to the region without being involved in the ongoing events taking place Europe and in the Middle East. Still, the President accomplished the significant achievement of establishing a framework for serious regional multilateralism in Southeast Asia, a region where American diplomacy has been intermittent since the Vietnam War. As such, the country has since joined the East Asia Summit, and held annual U.S–ASEAN (Association of Southeast Asian Nations) meetings, resulting in the improvement of relations with the majority of its member-states. However, Barack Obama’s plan to deter China’s efforts to take over the South China Sea by moving its greater military and diplomatic might to the region, would appear to have been unsuccessful. The backbone of this endeavor, the Trans-Atlantic Partnership Treaty, appears to be dead on the water, since Donald Trump’s stance against the treaty impossibilities its ratification. Additionally, despite Obama’s Administration incessant lobbying, China’s new Asian Infrastructure Investment Bank has attracted interest from several U.S. allies, including European states such as Britain, Germany, or France, as well as Asia-Pacific powers Australia and South Korea. Currently, it appears as if there is no stopping China’s militarization on the South China Sea. The country has built an enormous military complex in the Western Pacific, and currently claims about 80% of the Sea, through which passes $5 trillion of world trade every year, defying The Hague’s verdict on the past July. However, given that the case was brought up by the Philippines, who have since realigned themselves according to Beijing’s ‘ideological flow’, it becomes less likely that China will back down. 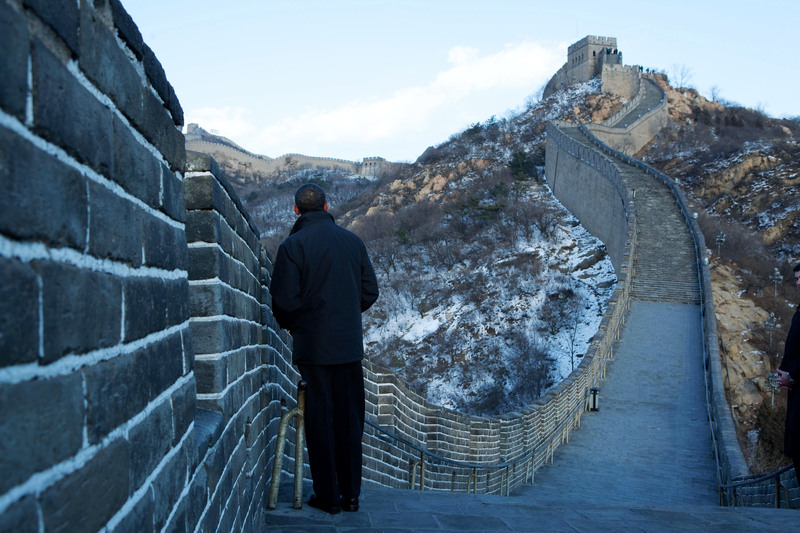 Barack Obama tours the Great Wall of China, 2009. Photo by White House (Pete Souza) / Public domain.